1) Epithelial Lining :- Almost all radicular cysts are wholely or in part lined by stratified Squamous Epithelium & range in thickness from 1 to 50 cell layers. The only exception to this is in those rare cases of periapical lesions of Maxillary Sinus. In such cases, cyst is then lined with a pseudo stratified cilliated columnar epithelium or respiratory type of epithelium. Ortho or para keratinised linings are very rarely seen inradicular cysts. Secretory cells or ciliated cells are frequently found in epithelial lining. 2) Rushton’s Hyaline Bodies:- In approximately 10% of cases of radicular cysts, Rushton’s Hyaline bodies are found in epithelial linings. Very rarely they are found in Fibrous capsule. The hyaline bodies are tiny linear or arc shaped bodies which are amorphous in structure, eosinophillic in reaction and Brittle in nature. 3) Cholesterol Clefts:- Deposition of Cholesterol crystals are found in many radicular cysts, slow but considerable amount of cholesterol accumulation could occur through degeneration & disintegation of lymphocytes, plasma cells & macrophages taking part in inflammatory process, with consequent release of Cholesterol from their walls. 4) Fibrous Capsule:- Fibrous Capsule of Radicular Cyst is composed of mainly condensed parallel bundles of collagen fibres peripherally and a loose connective tissue adjacent to epithelial lining. 5) Inflammatory Cells:- Acute inflammatory cells are present when epithelium is proliferating. 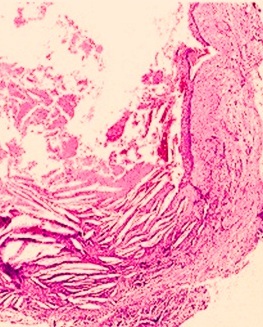 Chronic inflammatory cells are present in connective tissue immediately adjacent to epithelium. 6) Mast cells, Remnants of Odontogenic Epithelium & occasionally Satellite microcysts are also present. Some cysts are markedly vascularised. Various kinds of Calcifications are also present.